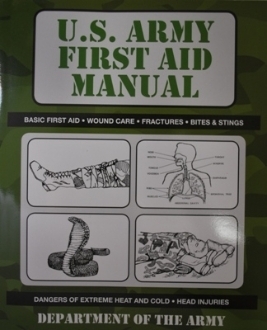 U.S. Army First Aid Manual offers skills and knowledge necessary for many life-threatening situations, with an emphasis on treating oneself and aiding others--of use to soldiers in the field, to outdoorsmen, or to anyone who may find themselves in a dangerous situation without a medical professional on-hand. This is the official manual for treating every type of injury and affliction in the field. Covering a broad range of topics in precise, easy-to-understand language, it emphasizes prompt and effective action in sustaining life and preventing or minimizing further suffering and damage. U.S. Army First Aid Manual is fascinating reading for anyone with an interest in military practice and an essential handbook for anyone who is regularly away from immediate medical care.